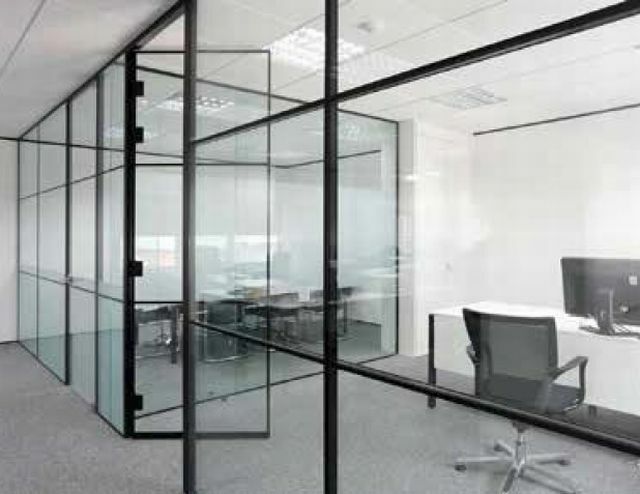 Single or double glazed partition system with 54 mm wide framework, delivering an acoustic performance of up to 46 dB (Rw). To complement the system, the IsoPro 54 mm framed doorset can be used for a unified appearance and high acoustics of up to 42 dB (Rw), or alternatively the ultra-slim framed IsoTec door, both of which can be banded glazed to provide continuity. No deflection: 27 x 54 mm (d x w) aluminium channel (K217–K220 to suit). ±15 mm deflection: 55 x 62 mm (d x w) two-part aluminium channel (K217–K220 to suit plus S408). ±25 mm deflection: 65 x 62 mm (d x w) two-part aluminium channel (K217–K220 to suit plus S409). No deflection: 27 x 54 mm (d x w) aluminium channel (K217–K220 to suit plus A103). ±15 mm deflection: 55 x 62 mm (d x w) two-part aluminium channel (K217–K220 to suit plus S408 and A103). ±25 mm deflection: 65 x 62 mm (d x w) two-part aluminium channel (K217–K220 to suit plus S409 and A103). Double glazed: 27 x 54 mm (d x w) two-part aluminium channel (K221–K224 to suit). Single glazed: 27 x 54 mm (d x w) two-part aluminium channel (K221–K224 to suit plus A103). Planet IsoClear 12 mm frameless door leaf - 34 dB (Rw). Planet IsoClear 12 mm frameless door leaf - non-acoustic.